Allira Tee is a Melbourne based illustrator and graphic designer who creates beautifully detailed drawings by hand. Animals, people, nature and illustrated patterns are often the subject of Allira's works, and are inspired by her people watching, travels and interest in animals. She has a wide selection of fine art prints available to purchase in her Etsy store and will be releasing her designs on greeting cards and wrapping paper very soon. We can't wait to see them! Read more about Allira, her creative background and inspirations in our July featured artist blog post. 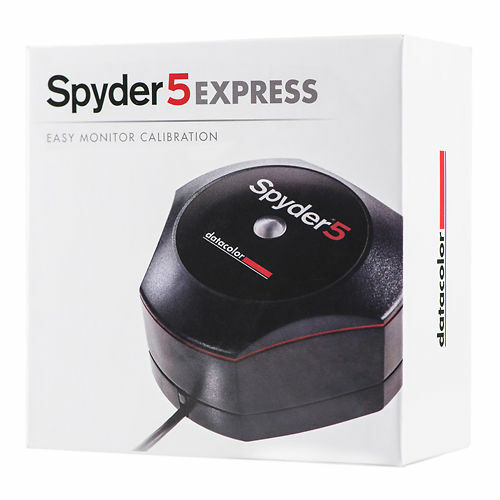 The Spyder5 Express is a simple, affordable solution for calibrating a monitor. Currently on back order - ETA of late April but subject to change based on supplier delivery date. Available to order now but separate shipments will incur additional shipping charges. 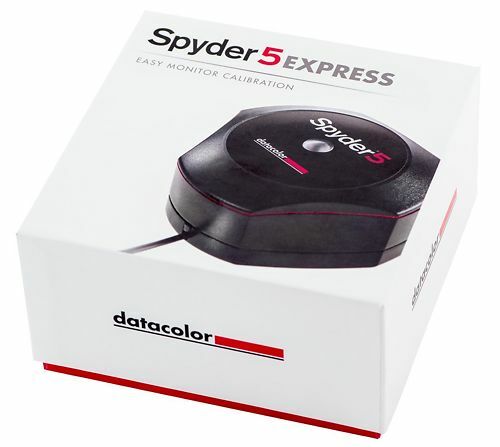 Spyder5EXPRESS monitor calibration will quickly color correct all of your computer monitors. Spyder5EXPRESS calibrates all your laptop and desktop monitors to an industry colour reference standard so you see accurate colours. Your image editing will be easier and faster, you’ll spend less time in the “print-edit-print” cycle, and you’ll waste less ink and paper. 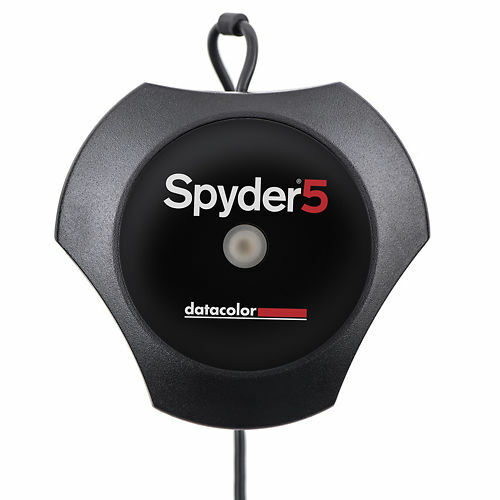 Next generation Spyder technology comes with a colorimeter that is compact, portable and protected. 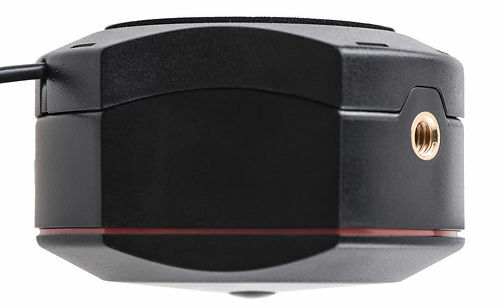 We’ve redesigned Spyder’s patented 7-detector optical engine to deliver up to a 55% improvement in tonal response, resulting in more accurate shadow detail and smoother gradient. 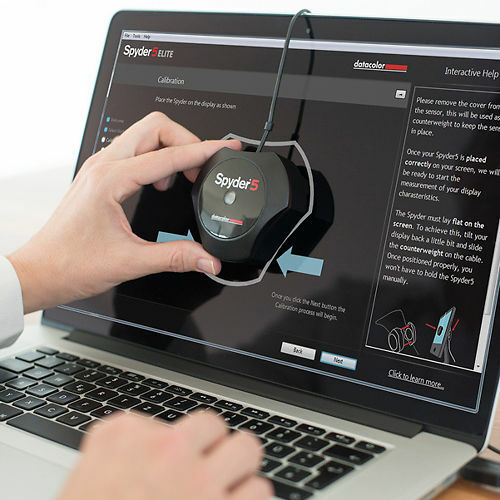 Spyder5EXPRESS software is extremely easy to use, with a simple step-by-step wizard that guides you through the initial 5 minute calibration process, for all of your desktop and laptop monitors. Then perform a fast monthly recalibration in half the time to keep colours consistent. Seeing a photo in “Before and After” mode allows you to see your calibration results. The Datacolor standard composite photos highlight changes in color, skin tones, shadow and highlight details, giving you confidence that your monitors achieve precise colour accuracy. Colorimeters - can only read light emitting devices, like monitors. They are generally the best (and most affordable) option for calibration monitors. Essentially these are like simple digital cameras with a sensor and some filters in front of the sensor to separate the different colours of light. Spectrophotometers - These measure the actual spectral wavelengths of light. They have their own light source so can handle both light emitting devices like monitors and reflective materials like paper. They're very good at print but not as good as colorimeters for monitors generally, as they have some difficulty reading deep shadows on monitors. A third type 'Spectrocolorimeter' - is something Datacolor came up with in their print calibrators. We at Image Science are not huge fans. Calibrators have filters in them and depending on the characteristics of the displays they are measuring, they may or may not support that type of display. CRT - Cathode Ray Tube - these are the older type of screens, the large thick monitors of yore with thick glass over the screen. Almost all of these are retired now. LCD - Liquid Crystal Displays - the modern flatscreen monitor. 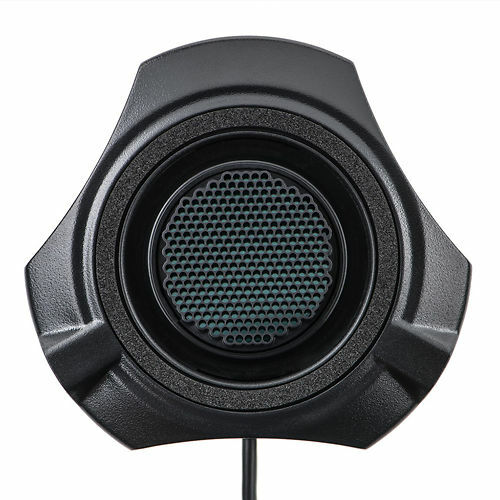 Available with two different types of backlighting technology - fluorescent and LED. OLED - An emerging technology, Organic Light Emitting Diode. Not many monitors are OLED yet, although we are now seeing laptops with them coming through. It's expected these will grow in popularity in coming years. Very high end TVs are now often OLED based. Front Projector - Popular in home cinemas and board rooms everywhere! What colour temperarture choices for white point does the system allow you to make? At a minimum, 6500K and monitor native should be offered. 6500K is the standard whitepoint in general use in the photographic world, and lower end monitors don't like having their whitepoint adjusted so monitor native is the best to use in those cases. However, ideally you can set any whitepoint you like, so that you can, for instance, adjust your monitor to look more like specific paper types. What gammas can you choose when calibrating? Pretty much everyone should be using 2.2. Some might want to experiment with L* in some obscure cases. How many patches are used (measured) in the calibration process? More (to a point) is better from a quality point of view, although it makes the process take longer of course. 200 to 400 patches is generally enough. Also - can the calibrator target the reproduction of specific colours, such as specific Pantones? Uniformity is still an issue with modern LCD monitors, especially lower quality ones. Does the calibrator have a system for assessing the screen uniformity? Can you calibrate multiple monitors connected to the one computer? Note, even if the calibarator supports this, your system must as well. This means all video cards in your system must have a separate LUT table. All Macs have this, and most desktop PCs as well. Some PC laptops have single LUT systems although it's been some time since we've seen this actually. ICC V2 is the most compatible and in fact for monitors there's really no practical benefit to ICC V4 support really. In general, table based profiles are more accurate than matrix profiles, so this is desirable. Devices with a monitor history report can show you how the behaviour of your screen is changing over time. This can be useful in diagnosing issues and planning hardware upgrades. Will the system give you a report on the quality of your monitor? Measuring a monitor's quality with the same device you used to calibrate it is of dubious benefit, though - as any error is likely to be repeated, so the device might well report that things are fine when they are not. We try and keep this as up to date as we can. If your OS version is not listed, check directly with the manufacturer as they usually have an update page listing compatibility up pretty quickly. Can you use the calibrator with an app on your Apple i device or Android device? Note, this will allow you to display calibrated images within that app only - there is no general support for colour management on mobiles/tablets yet. DisplayCAL is an open source application built on top of the excellent argyll cms open source colour management system. It is available for Linux, Windows and OSX. It's an extremely good calibration package, in many ways better than the manufacturer's own software, and well worth checking out - see this comprehensive page for details. Often DisplayCAL can be used to rescue older calibrators when the manufacturer has stopped supporting legacy operating systems. Hand curated articles, links and downloads to help you get the best from your DataColor Spyder5 Express. X-Rite i1Display Pro vs. DataColor Spyder 5 Range - Battle of the Calibrators! What to do if you have lost the key to your Spyder Product. DisplayCAL - What is it, when might you use it? DisplayCAL is excellent aftermarket calibration software. Use it to enable new features with your calibrator or to rescue an old one! 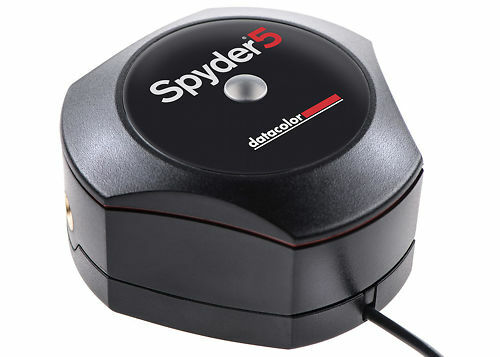 The most advanced Spyder5 calibrator with expert control and colour accuracy. The mid-range Spyder5 Pro monitor calibrator.